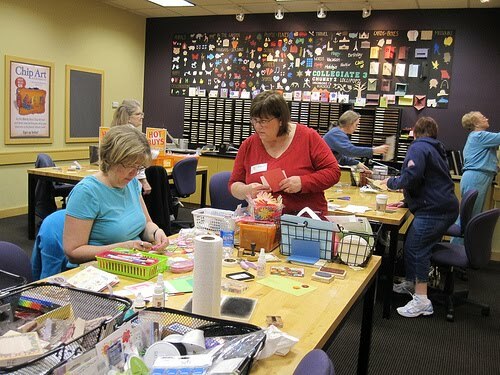 National Scrapbooking Day is tomorrow, May 1....and what better way to celebrate than making CARDS instead! Let's be rebels....join our scrappy friends, but make cards for our heroes! Are you going to an NSD Scrapping event? Be sure to bring along an OWH Flyer to pass out to everyone! Talk up the project and rope in some new folks. Maybe even take some card kits to set out for anyone who'd like to make an AnyHero card. Rope in some new peeps! For our 2,400 Facebook friends: We have SO many donated prizes, it's time to start giving some away! All day long on Saturday, watch our Facebook page for challenges...they'll be quick drive-by challenges, lasting maybe a couple hours or so. They'll be quick and easy, and most everyone should be able to find the supplies to create something for it. You'll need to post a photo of your card for that challenge on our FB wall - OR - post it on your blog and link it there. Each challenge will have a full note with instructions - so be sure to pay attention so you can qualify! Not going to be at home? Take your smart phone with you, because some won't be card challenges - they might just be a question or a game! So you can use your FB app to play along! 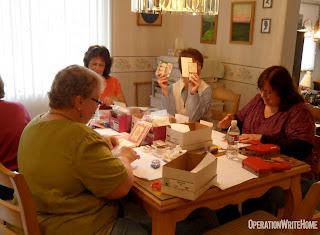 This photo came from Pam R in Florence KY - "Last week I participated in a shoe box swap and we asked the attendees to bring cards, paper, embellishments, etc they might like to donate to your organization. Let me tell you, I was blown away by the donations! over 250 cards from 16 WONDERFUL ladies! As soon as I get the stamp on the back and packed up, I will be mailing these to you!" Cindy C, Paducah KY.....WOW!! Absolutely stunning cards!!! Thanks so much. Many thanks to Wendy L. in Circleville, OH! Thanks to her husband and mother too for this terrific box of cards for our heroes! Well done!! Thank you, Diane S in Raleigh, NC!! 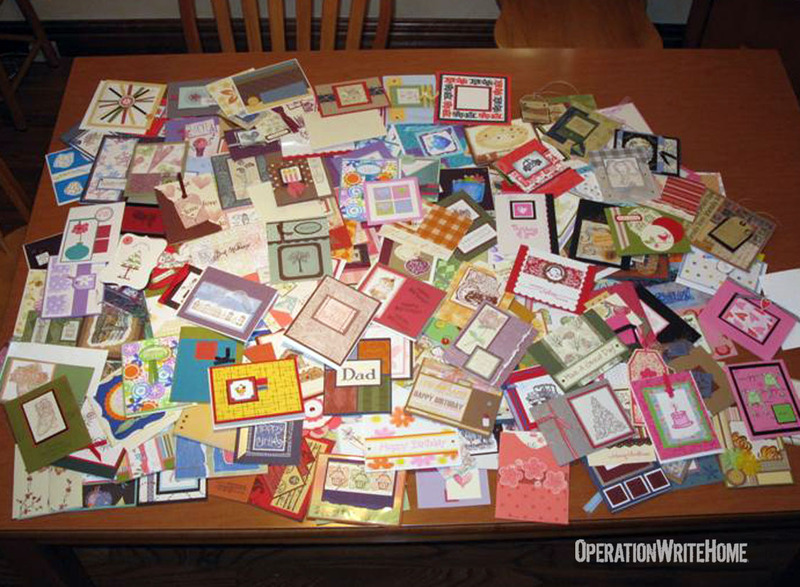 You sent such a nice collection of cards for our heroes to send to family and friends! Thanks too for the letters to heroes! Thank you Debi R. in Bainbridge, NY for the box of artwork...oops, I mean cards! So many different designs! lovely! Thanks too for the letter to a hero! Thank you, Martha C. in Zepherhills, FL for sending this beautiful collection of cards! Thanks too for the patriotic cards for any heroes! Thank you, Meredith T. in Zepherhills, FL for all the cards! You do such a good job! Thanks especially for the letters to heroes! Very clever!! Thank you, Eleanor G. in Manasquan, NJ for these terrific cards for our heroes to send to their dads! Well done! Thank you, Katherine G. of Lexington, KY for these beautiful birthday cards for our heroes to send home to their children! So thoughtful! Thank you, Maura H of Broadalbin, NY for the lovely cards and the letters to heroes! I just love that lawnmower stamp! Too cute! Thank you, Sara NL, Debra S, and Elaine O in Thomaston, GA for such a nice collection of cards for our heroes! These are great! Thanks too for the donation for shipping! You all rock! Thank you Diane G. in Barberton, OH!! Your box was perfectly packed with beautiful cards for our heroes! Thank you for sending such a nice variety! Thank you Debbie S and daughter Rachel in Rochester, NY! Your cards are beautiful! Thanks too for the letters to heroes! Good job! Many thanks to Lucy S. and the Carolina Mixed Media Artists Guild in Raleigh, NC!! Wow, these cards are awesome! Our heroes will snap these up quickly! Thanks to all the nice people at Till, Inc in Watertown, MA for these terrific postcards for our heroes. Very clever! Thank you Mindy A. and the Ellicott City Rubber Stampers!! Your cards are a handsome collection for our heroes to send to their dads! Thank you Marge M in Wayne, NJ for another perfectly packaged collection of pretty cards!! You rock! Thank you, Brennda Mc. in Independence, KY! These cards are great! So many designs! Lovely! Thank you, Lynn P for the huge stash of Christmas cards for our heroes! I'll be able to get a jump start on those Christmas boxes this summer! Thank you Mary W. in Concord, NC! These cards are beautiful! Our heroes will love sending these home! Thank you Jennifer C. of Harrisburg, NC for these pretty birthday cards for our heroes to send home to family and friends! Well done! Thank you, Seongsook D. in Elk Grove, CA!! Your cards are lovely, as always! Thank you too for writing a note to Any Hero and the generous donation for shipping! Paige S and the Daisy Troop...you all did a fantastic job on your AnyHero cards! Our heroes are going to LOVE them! 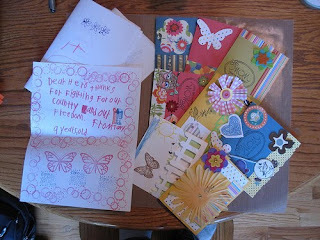 Teresa K and friends, Vancouver WA - thanks so much for your package of cards, it looks like you had fun! Thank you Cheryl B in Manchester, NH for all these terrific cards! You got a jump on Independence Day! Thanks! Carole G in Tuxedo, NY your cards are simply delicious! Our heroes are going to love sending these home! Melissa C of Concord, NC thank you for this beautiful collection of cards! The children did a great job too! Our heroes will love ALL these cards! Thank you Kaye D. of Indian Trail, NC! Your cards are lovely, as always! Clever card with the shoe! Thank you! Thank you Tamra D in Matthews, NC! Your cards are terrific! Love the butterflies! Tami W, Salem OR, wow! Love your style, our heroes are going to enjoy the cards. Thanks for the letters and donation too! Thank you SCAL User Group and Deloris T. of West Salem, OH!! Great cards! So many different designs too! Well done! Pat S. and the Frontier Pioneer Retirees of Spenserport, NY, thank you for sending this lovely variety of cards for our heroes! They're going to love them! Thanks too for the generous donation and the letter to a soldier! Mary E, W Jordan UT, thank you for the generous donation! Erika P, W Jordan UT - wow, thank you so much for the great MSD Challenge cards!! These are awesome, and no worries - you're seeding the boxes for other seasons! :) Bless you for the donation! Lindy C, Seattle WA - beautiful cards, thanks so very very much! Your donation is a blessing too! Judy K in Oxfordville, WI! Thank yo far these terrific cards and generous donation! Love the cards for dads!! Janet H, San Mateo CA - what a super first box of cards, thank you so much! Your generous donation makes our work possible, thanks! Anna V and Ladies Home Journal, NY - thank you sooooo much! Not only for the amazing mention in your magazine, but the generous donation as well! You rock! Thank you Margo S in Somerset, NJ for collecting and sending these cards from your daughter and the others! They did a great job. Thanks for the hero mail too, girls! Thank you Pat C, Vi T, Bridget S, and Hilma J in Shalimar, FL for this terrific collection of cards! Our heroes and their families will love them! Shirley H and friends, Kent WA - these are such pretty cards, thank you so much! Becky N and students, Elk Grove CA .... our heroes are going to LOVE your letters! Thank you! Sandy F, Irvine CA, love your cards so much...thank you! Cindy M, Pewaukee WI - these are so cute, I love your new stamps! Sandye C, Ft Wright KY....awesome cards!!! Cheryl M and Trevors Tuff Mammas, Knox IN....Thanks for personally delivering the cards, they are awesome! Banumathy H in Flower Mound TX.....thank you for the beautiful cards!! Shirley F in Defiance MO.....a wonderful package of cards and ANy Hero letters! Beth Ann C in Mason City IA, thanks for these wonderful cards....love them! Joy O in Carmel IN.....WOW! What a package. These are awesome!! Christine R, Elkhart IN.....a fabulous package of gorgeous cards! Shannon L in Calgary AB Canada....these cards travelled a long way. Gorgeous!! Family Programs Office in Lansing MI.....thanks so much for getting the kids to write Any Hero letters. These are wonderful! Linda W and Journals of the Heart......thanks for the wonderful cards!! Thank you Deb S at Morley Library Children's Room in Painesville, OH!! These letters to heroes are a real treat. Thank you for organizing this project! And thanks too for your donation! Barb B, St Louis Park MN......WELCOME TO OWH! This is a great first package....love these cards! Sharon N and Ladies Group in Waterloo IL....thanks so much for this wonderful package of cards and Any Hero letters!! Fowler and Friends, LaGrange IL......Another absolutely fabulous package of cards!! Thank you Sherry T and PeaceSpeakers Int of Collinsville, AL for the cards for our heroes and the generous donation! Well done! Union Level Baptist Church in South Hill, VA, thank you so much for the box of cards, and all the heart and soul you all poured into them. Thank you Brenda E. and Jackie P. and ALL the ladies at Stamper's Alley in Mooresville, NC!! I always pick up pretty cards from you! So much talent to share with our heroes! Nicole S. of Pittsboro, NC, thank you for this beautiful box of cards and generous donation! The card with the cattails is sooo clever!! Thank you Debi R for these terrific cards. Thank you for remembering the children of our heroes! Love the dinosaur! Thank you Kathleen B of Wilmington, DE for these terrific cards for our heroes to send home to their family and friends! Love that bird card!! Theresa P. of North Canton, OH, thank you for this perfectly packaged box of beautiful cards! Wow! Love the nice variety! You rock! Thank you Pat G. of Upton, MA!! Your cards are works of art! You make my job easy! Thank you for the hero mail too! Needed those! Many thanks to the generous people at the Ladies' Home Journal in NY! 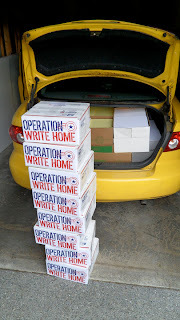 Lots of cards for our heroes and terrific publicity for OWH! Thank you!! Karen M, Dearborn MI - awesome package for the Make Someone's Day challenge!! Thanks so much! Helen S, San Diego CA - love these cards, the kids ones are especially adorable! Thank you Patricia F of Hixson, TN for the cards, donation, and hero mail!! Your color choices are striking! Love the pink and brown! Thank you, Nancy F in Trexlertown, PA!! Perfectly packaged pretty cards! Thank you!! My favorite is the dog and cat on the motorcycle! Made me laugh! Thank you Pat F of Mansfield, PA! Your cards are delightful! Our heroes will love sending these home to family and friends! Thank you too for the generous donation! Memorial Day Bloghop: Save the date! 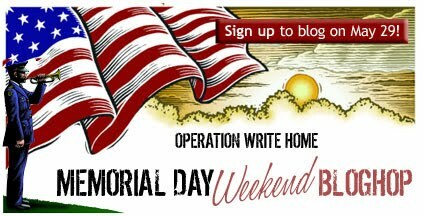 Our 2nd annual Memorial Day Bloghop is coming up...bloggers, be sure to sign up today to join in the fun! Details are on the bloghop page. 7,611 cards were shipped out this week! That's 24 boxes, shipped at a cost of $300 this week. We have now surpassed 400,000 cards sent overseas...wow! The photo at right is Sandy's first attempt to pack up the car to mail 8 of the boxes; the trunk was full of boxes and boxes of donated cardstock from Pollard Group, a printer in Tacoma WA! Stay tuned for some of this cardstock to make its way into challenge prizes on our blogs :) It's THOUSANDS of sheets of cardstock! Thank you Rob, Scott, and Christine and everyone at Pollard! Father's Day: May 15 or earlier, please please! We are SO excited that two major national publications are running a piece on OWH right now! (Rumors are there is a third, but waiting til we actually have a copy in hand!) Be sure to pick up copies at your newsstand...support those who support our heroes! And take the mags to your next OWH cardmaking party! This piece was such a HUGE surprise...and what a blessing! 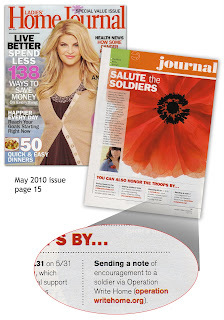 The magazine featured four opportunities for people to show their support for our nation's heroes—and AnyHero letters sent to OWH are one of them! Wow! Please visit the LHJ website, and be sure to stop by the Ladies Home Journal fan page on Facebook to leave them a thank you for spreading the word! Click on the image below to enlarge it and read more. An article in a craft magazine is much more expected...but just look at what they called OWH: "One of our favorite charities!" They also challenged their readers to each send in 10 cards—over a MILLION this year if they do! Wowsers! PC has a fantastic website if you haven't seen it — go bookmark it! (And it's a great publication, too—if you're not a subscriber, you can do that from their site!) 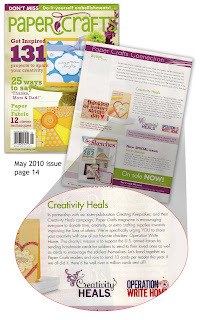 If you're on Facebook, be sure to stop by the Paper Crafts Magazine fan page - and leave them a thank you! WELCOME all our new cardmakers who have found us recently, especially from the articles in Paper Crafts Magazine and Ladies Home Journal! Thanks for checking us out! You may wish to check out the newbies post here, and be sure to watch the Mailroom video on that page too. 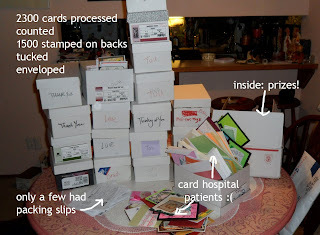 It'll help you figure out what to do when packing up your cards for our shippers. 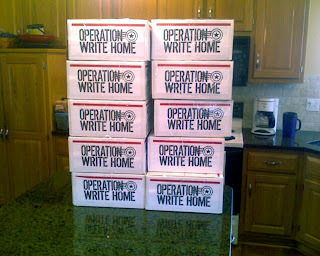 -stamp the backs or add labels with "Operation Write Home" on them. A tip: If you are not stamping or labeling the backs, do NOT tuck the cards into the envelopes. It makes double the work to take them out to stamp them—plus it will save you some work too. Lina W, Hampton VA, such pretty cards...and such a big loss in your family. We'll be praying...take time to grieve, your stamping will come back when it's time. Hugs! Emelyn C, Ridgecrest CA,thanks for your package of pretty cards, our heroes will love them! Velda S, Mesquite NV, great job on these cards by your class!! The sketches are working out great for you folks :) Your AnyHero cards are such a blessing, thank you! Thank you, Tina A. in Winter Springs, FL for this terrific box of cards! Our heroes will really go for these beauties! Thank you, Carrie W. in Clarksville, TN for this beautiful box of cards for our heroes! Wow! I love the blue/brown cards...my favorite combination! Judy K in Oxfordville, WI, thank you for these terrific cards for our heroes! Love the flowers and butterflies! Thank you Dolores A. in Frederick, MD for another beautiful collection of cards for our heroes! 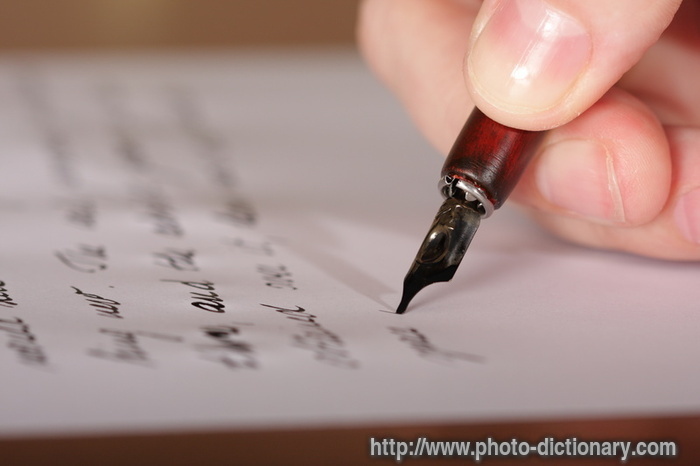 Your letters to heroes are most appreciated! Melanie J, Snoqualmie WA - thanks so very much for joining Elle's Studio challenge...your cards are fantastic! Thanks for the donation too! Nancy M, Fremont Ca, thanks for the fantastic grad cards - I needed these!! Jean U, Palmer AK - thanks so much for the lovely cards, and for bringing your daughter on board! Thank you Mary F. of Pasadena, MD!! I needed these "thank you" cards! Well done!! Thank you Ellen B of Pasadena, MD!! Lovely cards! Thanks for thinking of the children in our heroes' lives! Love the grad and dad cards too! Thank you Cheryl B of Havelock, NC for another terrific collection of cards! Lots of grads and dads will love getting these cards! Thank you for the cards and the letters to heroes! Kathy P in White Lake, MI, you've done it again! Pretty, perfectly packaged cards! Love the "unfrogettable" card! Thanks for the letters to heroes too! Lori R. in Springfield, VA, thank you for these terrific cards for our heroes! Some lucky family members will be getting these! Great sentiments..some funny, some touching. Thanks! Brooke W, Spokane WA, I can see you got your mom's talent - so glad she got you into making cards for our heroes!! Thanks for your AnyHero card and donation too! Debbie K in Burke, VA, thank you for this terrific collection of beautiful cards, the generous donation, and the letters to Any Hero. Your masculine cards are awesome! Thank you Elisa C. in Pittsburg, PA!! These cards are cute and clever! Our heroes will love them! Thank you, Katrina G. in College Park, MD for the terrific cards for our heroes to send home! Great patriotic cards too! Joan W, Tacoma WA - I finally picked up all your beautiful cards at PZ - thank you so much!! Betty W, Mountain Home ID, thank you so much for the wonderful cards - and AnyHero cards!! Jacob and the Cassady family, Camino CA, thank you so very much for the wonderful cards. Jacob you did a great job on yours, buddy! Thank you, Lindsay M. in Carrboro, NC!! Your cards are terrific!! Just what I needed! Thank you as well for the donation and the letters to Any Hro!! Samantha S, El Cajon CA - beauuuutiful cards for Elle's challenge, thanks so much! Stephanie G in NY, NY!! Thank you for all the clever cards, the generous donation, and the letters to heroes. Love the owls and butterflies! Maria O, Ephrata PA, what a wonderful first package of cards, thank you so much! Your donation is a big blessing, too, thanks!! Kathie V, Gig Harbor WA, thanks so much for all the great cards - our heroes will enjoy them! Thank you Karen G of Oakland Park, FL for the cute cards for our heroes to send home! Thanks also for the letters to Any Hero! I really needed those! Thank you Debra K in Naples, FL! Your cards for graduates are so clever! Love the 2010 dog tags! Thank you Pat G in Upton, NY!! Your cards are terrific! I really needed those pretty birthday cards too! Thanks also for the Hero card!! Thank you card makers at Christ Memorial Presbyterian Church and Missy S in Columbia, MD for the wonderful cards for our heroes to send home! Well done! Thank you Patty B in Phoenixville, PA for the terrific cards for the graduates in our heroes' lives! Well done! Thank you Betty B. in Conroe, TX for these lovely cards and the hero letters! So many beautiful designs and techniques! Thank you!! Patricia B in Winchester, VA, thank you for all the cards! You sent such a nice variety! I am especially grateful for the hero mail! You rock! Thank you Susan H and the Chica Chicks of Wickford in Wickford, RI!! Once again, you have sent some terrific cards for our heroes to send home to family and friends! Well done!! Cindy and the Los Gatos Elks Lodge #1857 - thanks once again! You all are so wonderfully prolific with your beautiful cards!! Jan R, Modesto CA - more lovely cards, THANK you so much! Samantha S, El Cajon CA, thanks for even MORE cards for Elle's challenge!! Kathay P and friends, Humble TX - thanks for the big box full of cards! Thank you Patti C in Ruby, NY for sending such clever cards for our heroes! The mortar board cards are too clever! Thank you too for your donation!! Daryl G, Arlington TX - thank you so much for your generous donation! 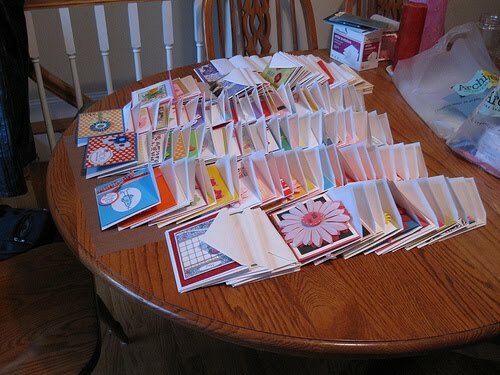 Carolyn L, Darien IL - so many pretty cards, thank you....and your generous donation is a blessing! Janine C, El Monte CA, much thanks for this box of beauties....and for your generous donation! Thank you Dawn M. of Charlotte, NC for these great cards for our heroes to send home to family and friends! You nailed the masculine theme! Thank you Joanne W. in Indian Land, SC!! These cards are too cute! I love the penguin cards and all the cards for dads! Well done! 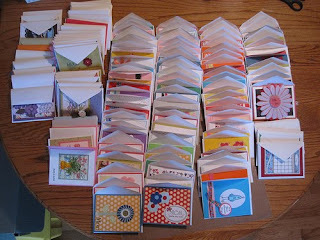 Theresa D, Kent WA - aweome job on all these cards, our heroes will love em all! Thanks so much for your donation too! Marilyn P in Columbia, SC, thank you for the terrific box of cards, the letters to heroes, the generous donation, extra envelopes, and boxes of pens! You rock!! Thank you!! Thank you Pamela L. in Mineral Bluff, GA for the cards for the graduates. Our heroes will love them! Thank you Lily H in Pittsburgh, PA for yet another box of incredible cards! Our heroes and their families will love these! Thank you for writing Any Hero letters too!! Kathie L, San Antonio TX, thanks so much, these are great cards! Paula M, Vista CA - thanks for all your great cards for Elle's Challenge - all those AnyHero letters too, awesome! Danielle C, West Valley City UT, bless you, you poured so much love into this box! Kerry A, San Jose CA, thanks for the big package of cards! Natalie M, Pingree ID, your Make Someone's Day box is fantastic, thanks! Ellen P in Amherst MA.....thanks for the Any Hero cards!! Cindy M and Friends of Checkered Cottage.....WOW! Another fabulous box of cards!! Thanks everyone! Judy B in Cleburne TX.....another fabulous box of cards! Thanks. Barb L in Fairfax MO......thank you for these awesome cards. MArtie M in Dayton OH....thanks for the beautiful cards and Any Hero letters! Alandra, Larissa and Camden M in Spring Creek NV....thanks so much for the great cards! Betty and Marilyn S in Columbus OH....thanks ladies for another great package! Patricia K in Raeford NC.....thank you so much for these beautiful cards! Brenda R in East Bethel MN....thanks for the great graduation cards! Kim M in Leitchfield KY....thank you for these beautiful cards! Linda M in Marietta GA....thank you for this awesome box of cards!!! Christa P and 7th graders at Renner Middle School.....thanks kids for these great cards! You did a great job on them! Sue A in Rockford IL......Another fabulous box of cards!! Love them!! Sue A in Rockford IL......WOW!! Another great package. THANKS! Diana L in Wichita KS....thanks for the great cards!!! Susan S in Grove City OH.....thanks for the beautiful cards!! Debbie G in Arlington TX....a wonderful first package of cards!! Thanks! Kathie B in Forest City NC.....thanks so much for the cards....beautiful! Jade Y in Elk Grove IL....thanks so much for the wonderful cards! Jennifer M in Marshfield WI.....another awesome package of beautiful cards!! Thanks! Marian J in Huber Heights OH....thank you for the great cards and ANy Hero notes. Karen S. of Mt. Juliet, TN, thank you for these terrific cards and generous donation! Such nice, spring cards for our heroes! Jessica W in Jeffersonville IN.....Welcome to OWH! Your first package is wonderful! Jennifer M and Trevors Tuff Mammas.....thanks so much for the great cards. Betty T in Salina KS.....thanks for the Any Hero letters!!! Michelle B in Louisville KY....thanks for the great cards! Thank you Diane C, Mindy G, and the Glenmoor Lifecare Community in St. Augustine, FL for these terrific cards and generous donation for shipping! Our heroes will love sending these back home to family and friends! Well done! Nicole S, Martinez CA, thanks for ANOTHER box of wonderful prizes! Woohoo, tons of inspiration! Plus a donation too...wow! Sarah B in Cypress TX....gorgeous cards!!! Thanks! Susan D in Tinley Park IL....thanks so much for the great cards! Heather D, Everett WA - thanks for the great cards and generous donation! Cindy M in Normal IL.....thanks for these beautiful cards and Any Hero notes! Love them. Carole Ann S in The Woodlands TX.....thanks for this awesome box of cards! LeAnn M in St Paul MN.....thank you for these gorgeous cards! Gai J in Dallas TX....another wonderful box of cards!! Love them. Rita D in Charlevoix MI....thanks for this awesome box of cards. They are gorgeous! 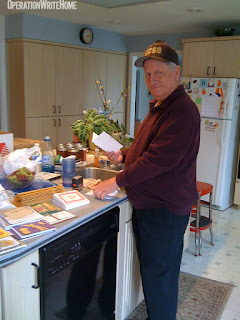 Judy K in Orfordville WI....thanks so much for these great cards! Anne P in Roanoke TX.....thanks for these wonderful cards! Here's a little fun video short...even our boxes lend a helping hand! Do you have any ideas for fun little videos like this? We're having a blast putting them together! Email if you have suggestions! Graduation cards are due by today so our heroes can try to send notes for those May graduations, and Father's Day are due May 15th. But if you, our 'regulars,' can beat those by a couple weeks, it helps us to get started shipping and not be waiting til the last minute to pack up boxes. Thanks! If you think you'll be close to the deadline, please make grad cards that say "congratulations" and Dad cards that are masculine thinking-of-you types. That way if you're late, our heroes can still use them. Shipper needs this week: Now updated on our "Biggest Needs" post here. Direct video link, in case the player is giving you fits! For more info on the Madison, WI dog training program mentioned, visit Captial K9s, Madison WI. One of our cardmakers did a little research she wanted to share. "I'm working on a few AnyHero cards and have such a hard time figuring out what to write," said Nicole. "I found some ideas on a few other websites and thought it may help other people." Thank you so much for your service, being away from your home, family and friends. I just want to let you know that I appreciate it and thank you for it. Please come back safe and soon. We stand behind you and support you all the way. Thank you. I appreciate what you all are doing for our freedom. As a veteran, I know what you are going through. Thank you. Sending you big hugs and cheer from home. Thank you so much for your service and bravery. Come home soon! Thank you for your service. Your bravery and strength of character represent what America stands for. Bless you! It's a great honor to be able to thank you for serving our country. You're very brace for the service you're doing for freedom! Thank you for all you do. You portray what we American value most...freedom. Thank you for your commitment and bravery. May this card help bring you good health, clarity of mind and the courage you need to be successful. Each of you play such an important role in protecting our country. Please know that we are all behind your efforts and appreciate you and pray for you daily. You are all heroes to us! I cannot find the words to express how grateful my family and I are that you are putting yourself in harm's way to protect our country. The U.S.A. is the land of the free and the home of the brave...but only because of courageous people like you. We wish you and your fellow troop members complete safety throughout your tour of duty. May you return home soon to a true hero's welcome. Thank you. We don't know each other and will probably never meet, but I want you to know that you and all of our troops are in our hearts and prayers each day. Please always remember what you're doing will always be appreciated and never forgotten. 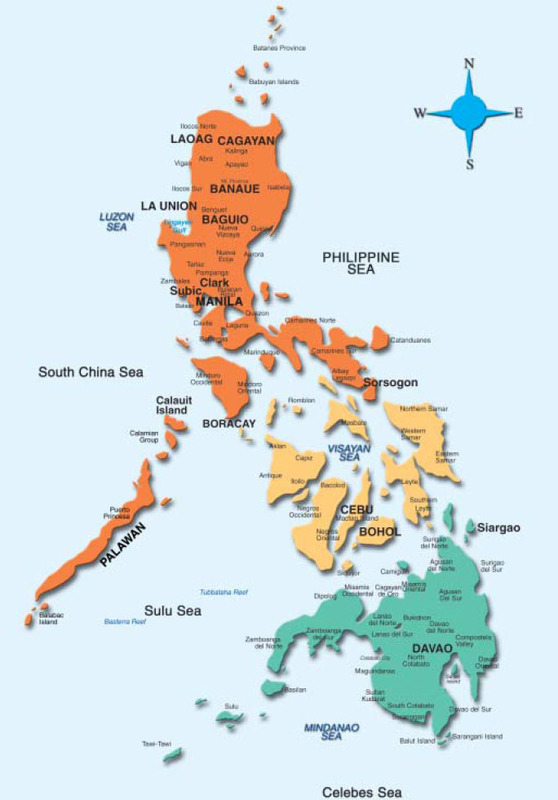 I wish you all the best and pray for your safe and speedy return home to your family and friends. Thank you. What other message suggestions do you have? This day, we'd like to say a special thank you. And that's a thank you to the families of our heroes lost on the battlefield. We don't often know what happens to our heroes as they transition off our lists; we send repeat boxes to them til a certain time goes by with no response....we don't know why, whether they're simply busy, have redeployed, or may even have fallen during a firefight. One thing we do know is that twice, we've received a note from a family member, telling us that one of our cards was the final piece of communication they had with their loved one's handwriting. That alone, in just two cases, makes the hundreds of thousands of cards worth it. For just two. 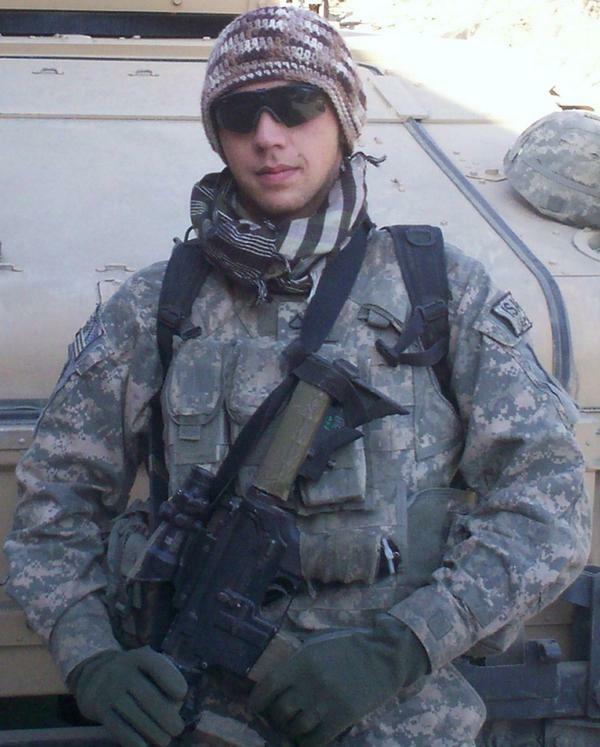 Today is the anniversary of the loss of one of our own OWH heroes...PFC Rick Dewater. He was killed in the Korengal Valley of Afghanistan one year ago, at the age of 21—far too young for a man with such a future ahead of him. It's not an anniversary to celebrate, but one to commemorate—and to remember the thousands of family members across the US who are missing their own hero. Today and every day. We see them in the grocery store, and may wonder why they're distracted from their child's rambunctious behavior. We see them in our own workplace, and have no idea the grief in their hearts. So, dear families, our fellow Americans, we grieve with you. Today we remember not just one hero, but all who have been lost. We appreciate your sacrifices...and thank you for raising up heroes to defend our nation! Some of you may have noticed a little poem Darlene posted on her blog during our Bloghop—and it seemed like something too darned cute not to use more broadly! Thank you for sharing it, Darlene! This is a short challenge...and it's got a specific goal! Our shippers need to keep up with the anytime cards as well as the wonderful grad and Dad cards...so we need your help in rounding out those boxes! What's an anytime card? Thinking of you, hello, birthday, love, miss you, anniversary, etc...as well as blank. All those non-holiday types. Include at least two AnyHero cards. On your packing slip, be sure to write that it's for the Make Someone's Day challenge! Ship early enough that they arrive on or before Monday, May 10th. And with the slow mail we've had lately, you may want to give it a few extra days cushion! If you'd like to go that extra mile (though this gets no extra entries since it's no requirement), include a donation for shipping. 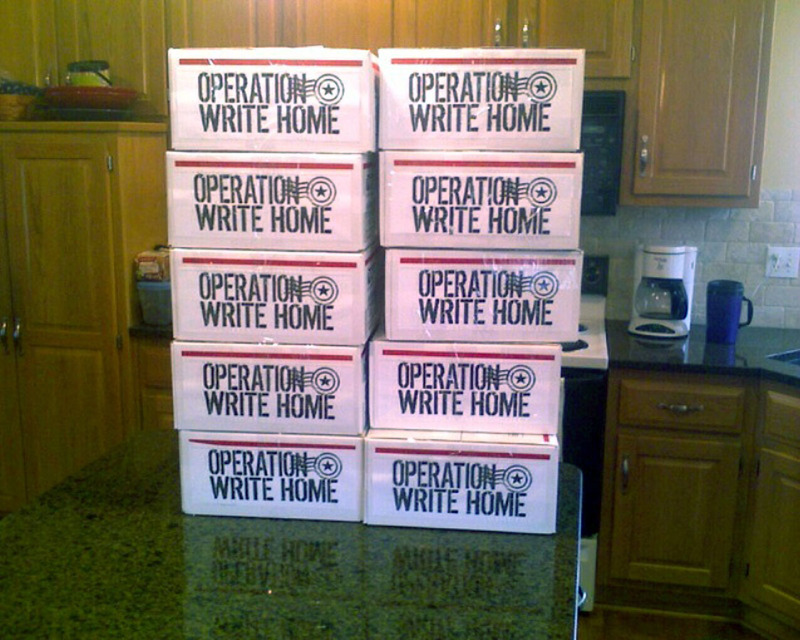 That keeps these boxes heading out overseas to our heroes! And what prizes can you look forward to? Well well well....just take a look! FIVE lucky winners will get some goodies, thanks to Marcy! Bloggers: If you'd like to help us get out the word, go snag a banner for your blog from our Photobucket album. We have one that's animated, others that are static, and the large one at the top of this post is for those who choose to write up a blog post and include a large image for it. 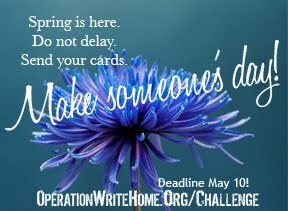 Please link back to this blog post or to http://operationwritehome.org/challenge so people can find out the details! Your shippers worked so hard to get these boxes filled with a great selection. They've spent weeks preparing—sorting by themes, removing glitter cards, stamping the backs, matching with envelopes (we had to buy another 18,000 envelopes because we ran out! wahoo! 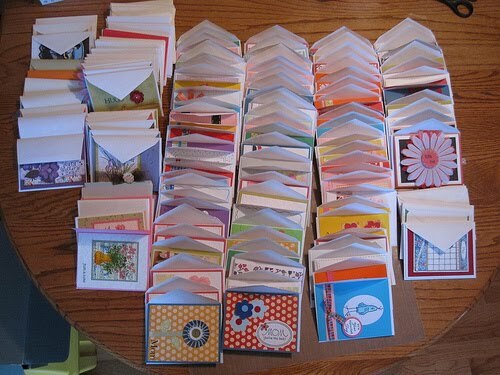 ), clearing the card hospital of all Mother's Day cards in time for our shipping deadline. So your shipper may not have gotten back to you with emails as fast as usual, but every time we approach a deadline, prepping for shipping takes us tons of time. So thanks for your patience!! Graduation cards are due by April 19 so our heroes can try to send notes for those May graduations, and Father's Day are due May 15th. But if you, our 'regulars,' can beat those by a couple weeks, it helps us to get started shipping and not be waiting til the last minute to pack up boxes. Thanks! If you think you'll be close to the deadline, please make grad cards that say "congratulations" and Dad cards that are masculine thinking-of-you types. That way if you're late, our heroes can still use them. And as always, keep sending in lots of AnyHero cards plus the everyday themes—we need those as well as Dad & Grads! What were you doing in 1991? 1991 was the year Ricky was born. That was also the year the Gulf War ended. Yeltsin was elected. Clarence Thomas made it onto the Supreme Court. Haiti's president was siezed in an uprising. I was living in San Francisco, taking sailing lessons, just living life obliviously. It doesn't seem all that long ago, actually. In 1991, I never noticed Ricky was born. Did you? Ricky was destined to become Marine Lance Corporal Rick Centanni. A hero. One who gave his life for us. For me. For you. For millions of people who he'd never meet. The nation didn't notice he'd arrived on the day he was born. Most Americans won't notice that he's gone. But his family will miss him every day for the rest of their lives. Our OWH family offers our condolences—it may not ease their pain, but we grieve with them. And we redouble our own efforts to support those still in harm's way. Heroes who daily put their lives on the line for us, for a nation full of millions they'll never know. A nation that often obliviously goes on with life, not recognizing the sacrifices that allow us to live in freedom and peace here at home. Our cards are so simple a gesture, so small a repayment for all that is done for us; but it's what we have to offer. A connection with home, for those serving in our armed forces. Marine Lance Corporal Rick Centanni, rest in peace. This sweet little chickie card was the hit of Facebook recently - so it's just a little extra bonus on this Thankful Thursday. Tooooo cute! Thank you, everyone! 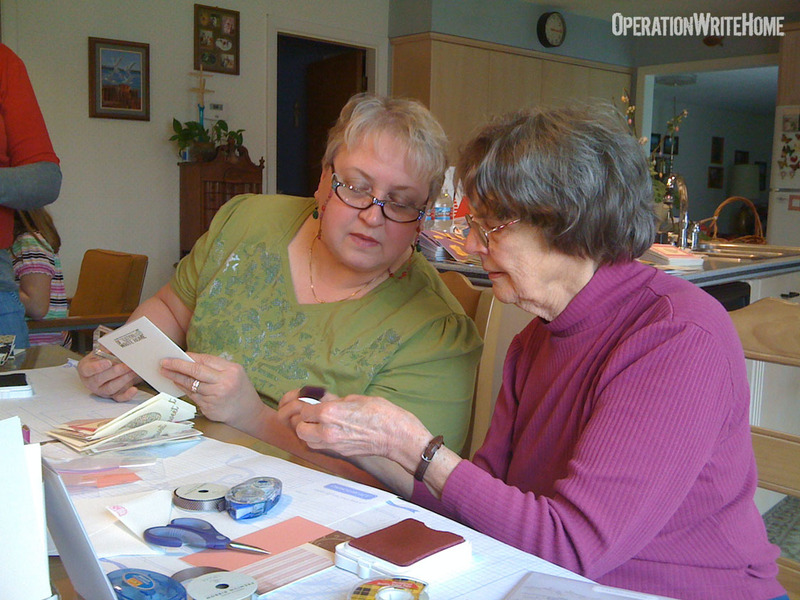 Our shippers received 8,914 cards during this past week—the last of the Mother's Day cards! So many Moms all across America will soon be receiving love from their kids - and wives may well be getting some of these from their sweet hero husbands! Due to the cards that have come in, it also appears we'll be covering allllll of our recent requests with cards—we were a little nervous about being able to meet the needs of our ongoing units as well as all the requests from March, but...our cardmakers came through, thank you! Thank, Susan G in Barnegat, NJ!! Your cards are terrific! Thanks for the Grandmother cards! Clever! Thank you, Susan A. in Ridgewood, NY for these terrific cards for our heroes! Well done! Thank you Pamela L in Mineral Bluff, GA!! Wonderful cards for our heroes to send home! Thank you! Pat Q. in Bethel Park, VA!! You rock! Thank you for these beautiful cards! Our heroes will love these, and so will their families! Thank you Alice S in Philadelphia, PA!! These cards are so elegant! Just lovely! Thanks too for the candy bars! Treats for the troops! Thank you Kathy P in Windham, NJ!! These Mother's Day cards are terrific! Thank you for packaging them so nicely! Very helpful! Thank you Melisa F. of Woonsocket, RI for the terrific cards you sent for our heroes!! Thank you, Marci K. of Sutton, MA!! So many beautiful cards for our heroes! You rock! Thank you Elaine H. in Keene, NH! Terrific cards for the graduates! Pam J, Duvall WA - beautiful cards as always...thank you so much! Paula M, Vista CA, lovely cards! Wow thank you so much! Michelle B and the whole town of Oceanside of NY -- and all your helpers nationwide!! -- thank you so much for this incredible collection of cards! Wow!!! Alex L, Boise ID - grrrrrreat cards, thank you so much for coordinating all your friends too! To the 5th Graders at Galileo in Mrs. D's class - SUPER job!!! Much applause!! Nej D, Meridien ID, wowsers, so many pretty cards - thank you! Debbie F, Nampa ID - thanks soooooo much for all your wonderful cards! Jennifer H, Boise ID - wonderful cards, thank you so much! Cindy K, Boise ID, lovely cards, thanks so very very much! 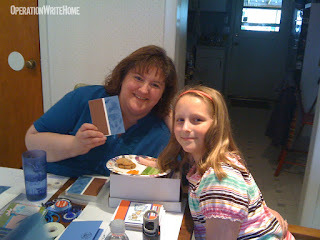 Betty W, Mountain Home ID, love your cards, our heroes will enjoy writing home on them! Heather J, Buhl ID - thanks so much for all your pretty cards! Caralee B, Meridian ID, thanks so much for sharing your creativity with our heroes! Diana Y, Idaho - thanks so much for your beautiful cards, they're appreciated! Sandi D, Boise ID - great cards, thank you sooo much! Leslie F, Clinton UT - and students - thanks so much for the great cards and letters for our heroes! Veronica C, Truckee CA - your dad cards are here - and wow! Go lady go, beautiful work! Nancy C, Hollister CA - yowsa, you've been busy again! Thanks so much for all the great cards again - welcome back! Becky N, Elk Grove CA - thanks so much, your cards are just so perfect all the time! (I need to make cards with you someday and see how you do it!) Thanks for the AnyHero letters from the kids too - they're great! Sandy F, Irvine CA - awesome cards, as usual! Thank you! Dana, Vancouver - thanks for coming to the OWH shindig, and bringing extra cards with you, they are just beautiful! Lindy M in Warrensburg MO.....what great cards. So pretty! Cindy M and Friends of Checkered Cottage.....Ladies, this is an awesome box of beautiful cards!! Thank you. Laura S in Chisago City MN.....thanks so much for these beautiful cards!! Dorothy B in Corpus Christi TX.....another wonderful package of beautiful cards! Thanks. Tammy F and Trevor's Tuff Mamma's......beautiful cards!! Thanks ladies! Ms Plaisance in Little Falls MN.....thanks for this great package of cards. Joan H in High Ridge MO.....another box of gorgeous cards! Thanks. Betty T in Salina KS.....these are wonderful cards! Thank you so much. Jennifer M in Austin TX.....thanks for these fabulous cards!! Love them. Esther E, Vancouver WA - wow, you are so sweet, not only roping us all together to make cards, but making an extra package ahead too! Thank you Cathy C of Grovertown, GA for your cards and donation! 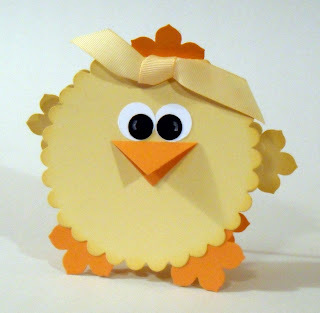 Love the chicky Mom's Day card! Too cute! Debby K in Fond Du Lac WI.....thanks so much for these awesome cards!! Sue S. in Henderson, TN, thank you for these wonderful cards! Love the Father's Day cards, so masculine! Thank you too for the Hero Mail and the donation for shipping. Pam C, Los Angeles CA - stunning cards, our heroes will love them all! Thank you Sara NL in Thomaston, GA!! Your cards are beautiful, and our heroes will love them. Thank you for the generous donation and the wonderful letters from the girl scouts! Thank you Fabre S. in Holliston, MA for your beautiful cards and generous donation! You rock! Thank you Laura C. in Dracut, MA for the beautiful cards and the generous donation! Lovely. Nancy Y, Campbell CA, bless you, these grad cards are just wonderful - as are your AnyHero letters and donation! Cynthia C, Scottsdale AZ - your package is finally here, yay! Thanks so much. Diana K and Sassy Stampers......WONDERFUL cards ladies! Thank you! Thank you Diane W of Stoneham, MA for the lovely cards and the generous donation for shipping! Paula S in Stamford, CT, thank you for another magnificent box of cards! Thank you too for writing letter to our heroes and sending such a generous donation for shipping! Mandy M in Chatham IL....thanks for the beautiful cards! Thank you, Cathy B in Columbia, SC for sending these beautiful cards, generous donation, and hero letter! Thanks for packaging everything so nicely! You rock! Carol H, Vancouver WA - it was so great making cards with you...thanks for bringing an extra box and a donation - plus your sweet hubby! Shirley S in Columbus, MS, thank you for these terrific cards and the generous donation! Our heroes are going to love sending these home! Thank you Lily H. in Pittsburg, PA! Your cards are lovely, and your calligraphy really sets them off! Thanks for sending the extra sentiments too! Thank you Donna M and friends in Atlanta, GA!! What a nice collection of cards you sent for our heroes! Thank you Susan S. in Egg Harbor Township, NJ! Great cards! Love the "Sparkle" card especially! Thank you, Katherine G. in Lexington, KY for these terrific "love you" and "miss you" cards! Just what I needed!! Ryan G, Brea CA - Fabbbbulous cards, our heroes will love them! Karen J, Astoria OR - thanks for the lovely cards, they're wonderful! Janet S, Astoria OR, your cards are so pretty, thank you! Maggie H, Holly MI, our heroes will be delighted to write home on your cards...thank you! Mary R, Coquille OR - thanks, these cards are just delightful! Shelly H, Twin Falls ID - your cards are fantastic, I love your style! Gayla G, Dillsboro IN, love the Mom cards - thanks sooooo much! Donna M, Ft Wainwright AK - lovely cards, thank you so much!! Robin S, San Mateo CA, your cards are each a treasure unto themselves...thank you! Karen T and Paradise Scrapbook Boutique - it's amazing that sooooo much creativity can come from your group, wow! Thank you! Thank you, Melissa B. in Montreal, Quebec!! Your cards are always lovely!! Thank you too for writing a letter to a hero!! 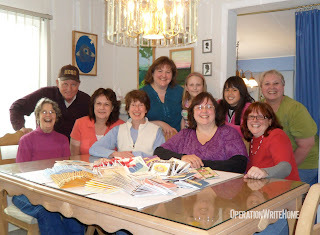 Diana K and the Sassy Stampers in Denton TX......ladies, thanks so much for another box of fabulous cards! Denise L in Rochester NH.....thanks for the gorgous cards!! Love them. Thanks to Amy C in Framingham MA for the great cards!!! Love them. Thanks to Patricia S in St Louis MO for the beautiful cards.....very pretty! Renee H in Andover MN......WOW! Beautiful cards!! Shannon H. of Winterville, ME, thank you for these beautiful cards for moms! And the "Thankful" cards are yummy! Thank you too for the generous donation and the letter to a hero!! Jody M, Scottsdale AZ, thanks so much, your cards are always amazing, and your generous donations are sooooo appreciated! Karen H in Monticello MN.....thanks so much for this great box of cards. So Pretty!! Carole Ann S in The Woodlands TX.....WOW!!! This is an awesome box of fabulous cards!! THANKS! Thank you Trudy P. of Merrit Island, FL!! Your cards are the best! Our heroes will love sending these home to family and friends! Joyce I in Palm Bay FL.....thanks for the wonderful cards! Barbara B in Lakewood CO.....wonderful cards! Love them!! Janis D in Olustee OK.....thank you for this awesome package of cards! Diana H in Centennial CO.....WOW! What awesome cards!! Debby M in Las Cruces NM......another great box of wonderful cards! Sandra M in Fremont CA.....thanks so much for these wonderful cards!!! Andrea J in St Germain WI.....these are such beautiful cards!! Thanks. Deb J in Bolckaw MO......another FABULOUS box of cards! Thanks for having them sorted out so nicely. Montie D, Simpsonville SC - thank you so much for your generous donation! Rhonda M, Grantsville UT - love your cards, they're so pretty, thank you! Patty S, Santee CA - your cards are so cheery, thanks so much...and your donation is a blessing! Vicki W, Reno NV - thanks so much for the perfectly-packed-package! Great cards, our heroes will love them! 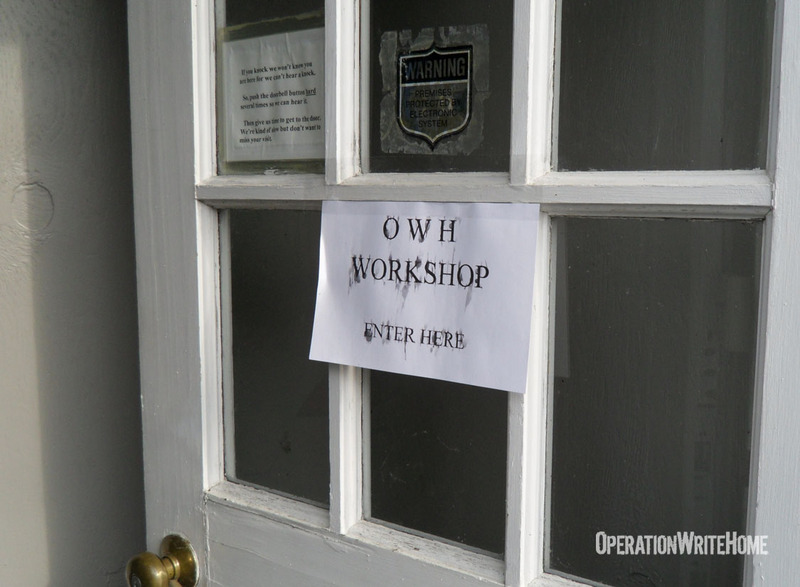 This past weekend, Vancouver WA was the location of some fun OWH action! Stampers from the Vancouver area, as well as several hours northward, gathered despite rainstorms that tried to dampen spirits—but these crafters were not to be discouraged! Even the sign on the door was attacked...but the crafty creative forces inside repelled the rain! 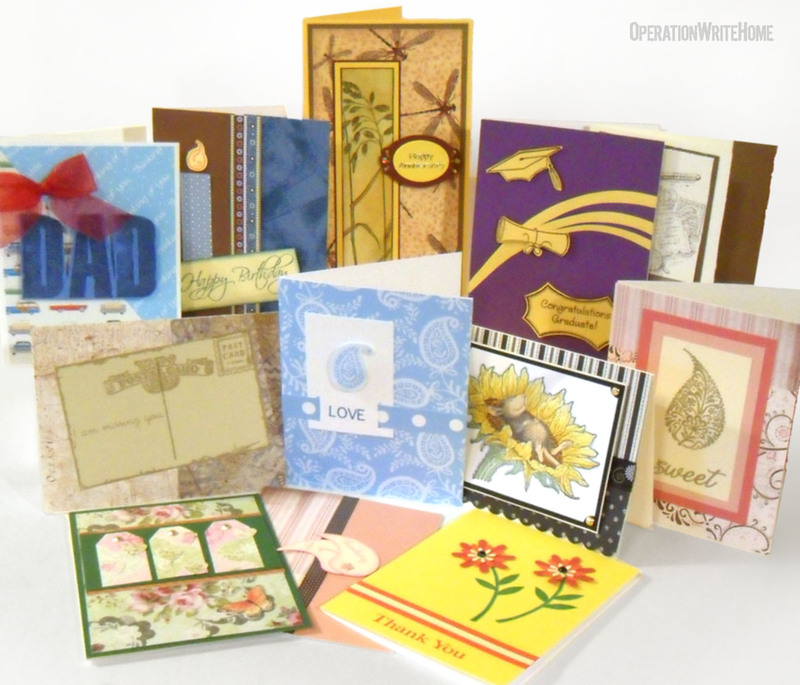 This small yet mighty band of cardmakers created some incredible designs, pictured here. Though the goal set before us was 200 (with our hostess Ellen secretly praying to get to 250! ), the team's desire was to go for quality over quantity. It's nice to come out of an event like this with large numbers—but not if it means the cards will fall apart or be put together haphazardly! Our heroes love the cards for their creativity, and MUCH creativity was poured out into each design. 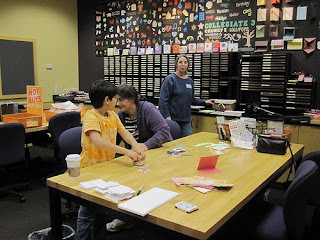 This cardmaking party also brought us some kids who could also wield a self-inking stamp! 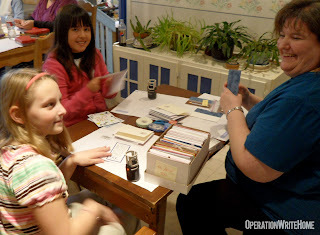 These girls tackled box after box of cards that had arrived at the nearby shipper's house without "Operation Write Home" on the backs, so this was an incredibly important task for them to accomplish. The two young ladies hadn't met prior to the cardmaking party, but we suspect a new friendship is going to be blossoming after how wonderfully they got along together! The other table in the room was a-buzz with peals of laughter, the whizzing of tape guns, the snipping of scissors, and much inspiration being passed around the table. It's always so exciting to hear the passion of others who share the love of papercrafts as well as love of our heroes. Sharing stories of loved ones deployed and family histories of service members always reminds us of why we all participate in OWH—and motivates us to keep going! 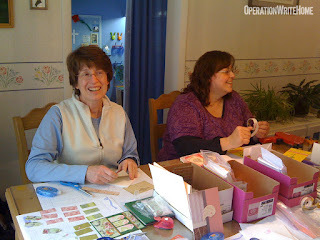 The crafters brought prepared card kits with them: all the fixings to create up to 20 of their designed card. The papers were cut, images were stamped and colored as needed and all the materials required were on-hand. The group set to work while laughing together, snacking (of course! ), telling stories, and learning new techniques and finding new tools along the way. And the whole group was so full of grace and kindness toward each other — OWH crafters are the best people! Grand total: 887 hero smiles....and another 887 smiles when the cards return stateside! If you host or attend an OWH cardmaking party, be sure to take some photos - and write a story about your experience, so we can post it here on the Homefront Blog to encourage others! This coming week the last of the Mother's Day cards received last week are making their way into boxes....many many thanks to all of you who made the cards, and especially to all who got them to us early this year. Lots less stress during this final week than we otherwise would have experienced! She started out last year wanting to help our heroes. 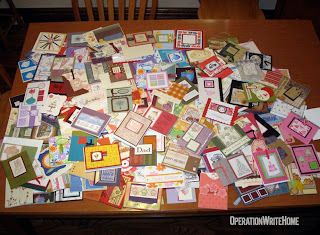 She had planned on hosting a cardmaking party then, but didn't know where to start. 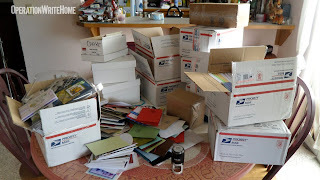 So she talked with her friends in the Hero Arts flickr group and asked them if they had any old unused craft supplies she could have to support the project, and immediately got tons of packages donated! Then two months ago she went to her favorite LSS, Archivers, and talked to the manager about using her store's craft room. "She was more than happy to help," Hannah said, "and put the event in her monthly event calendar that shoppers pick up." Archivers donated supplies too! After picking the date and a theme (mother's day), Hannah announced it on her blog, sent emails to her friends to forward to others, and contacted OWH to be advertised on Facebook, Twitter, and so on. Then a friend of hers, Deborah, contacted the St. Louis Post Dispatch to let them know a teen was doing something for the troops. They came to interview Hannah, and published it in the paper on March 13th — just 2 weeks before the event. The event was held on Saturday, March 27th and was open to anyone from 10 am to 4 pm. "People came in and out all day long," said Hannah, "but I think there was about 30 people that made cards altogether. They all made wonderful cards!" A week before the event, Hannah sat down with all her little cousins from 4 to 9 years and asked them to write hero letters, and with her Mom's help she just made sure everyone had everything they needed and showed them how to use the tools. The result was 208 beautiful cards and 17 AnyHero letters from little children! "I had so much fun packing all the cards up,", said Hannah, "and felt very proud as I left the post office, knowing that so many Mothers were going to be so happy to receive cards from their loved ones serving our country." We're very proud of Hannah's efforts too—what an awesome project to take on!